What’s lurking in your house that could make your pet sick? Turns out, lots of things. 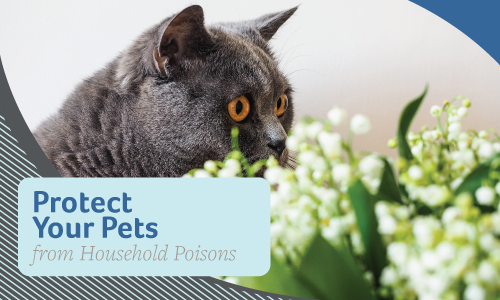 National Animal Poison Prevention Week is March 18—24, and we want to encourage you to take some time to look around your home and be aware of substances that need to be out of paw’s reach! Human medications. Keep them in sealed containers and locked away as pets might see loose pills and think they’re treats. Plants. Dogs and cats like to chew on plants, but some can make your pet very ill. The most common toxic plants are azaleas, lilies, daffodils and tulips. Don’t let your pets chew on any part of these plants. Whenever you get a new plant, do some research and make sure they won’t make your pet sick if ingested. Antifreeze. Antifreeze tastes sweet to pets, but even very small amounts can cause fatal health problems. The poisonous substance in antifreeze is ethylene glycol, so to limit your pet’s danger, consider switching to an antifreeze that contains propylene glycol instead. Rat poisons and snail bait. Even if the box says “pet safe”, these products contain substances that can be as deadly to your pet as they are to the critters you want to eliminate. Avoid having them in your home and choose non-toxic options for pest control. If you ever believe your pet has been poisoned, contact us as soon as possible. The Pet Poison Helpline is another great resource for immediate assistance.